Martin's has been cooking home-style favorites since the 1930s. Known for its fried chicken, the restaurant serves lunch and dinner Sunday through Friday and has been featured in the Wall Street Journal and Garden & Gun magazine. 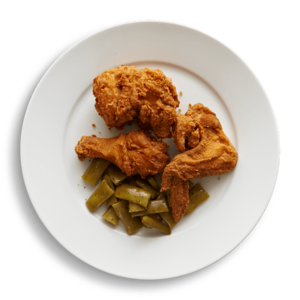 Monday-Friday, 11 a.m.-3 p.m. & 4 p.m.-7:45 p.m.; Sunday, 10:45 a.m.-1:45 p.m.
Martin's Famous Fried Chicken stays true to what folks have come to expect from the Southern staple. The meat is moist and the breading crisp, with just a hint of seasoning. But Martin's serves up something extra in addition to the usual breast, thigh and drumstick combination. Guests at the Montgomery eatery will get a taste of the "pulley bone," a name used in the South to describe the wishbone or Thanksgiving bone. Said to be a tradition started in ancient Europe, breaking the wishbone is now common practice, especially for children, following holiday dinners. One person takes an end of the bone, while a second person takes the other. They pull the bone until it breaks. The person left with the longest piece of bone is granted a wish. Though the Europeans likely used bones from geese, which were seen as having supernatural powers and often cooked and served at feasts, today the tradition usually involves a bone from a turkey or chicken. At Martin's, they bread and fry the pulley bone, with pieces of meat from both adjacent breasts attached. The fried chicken — pulley bone and all — paired with traditional, Southern-style vegetables and the restaurant's noteworthy cornbread, frequently is named the best fried chicken in the city by readers of the Montgomery Advertiser.